Im back I wish you had a Button so I could put you on my sidebar.. some day I will have a French kitchen like you have. Oh my gosh, your tables are simply the BEST!. 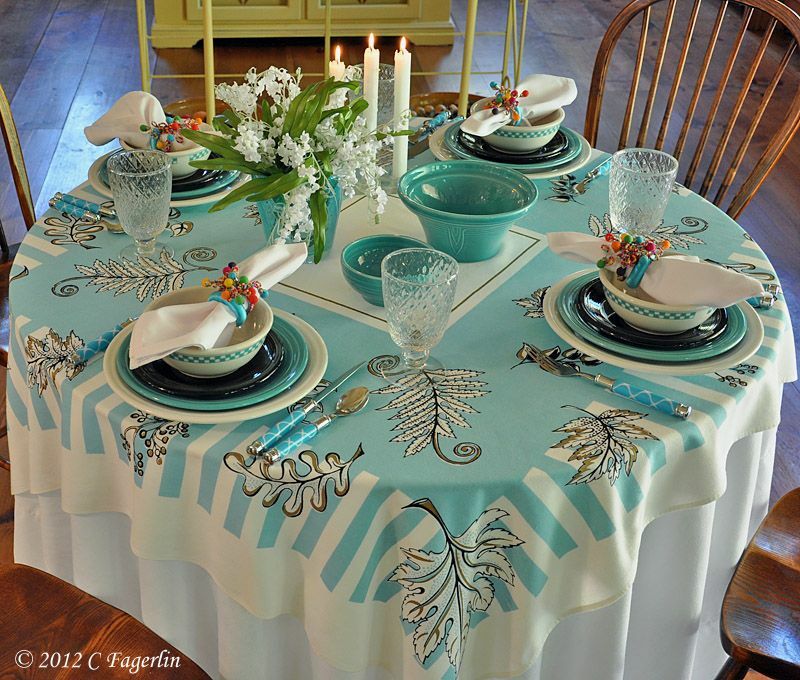 The colors, they way you arrange everything, the tablecloths, the napkin rings, gosh, I want them all! I just love coming here to see what's next. Thanks for the inspiration. 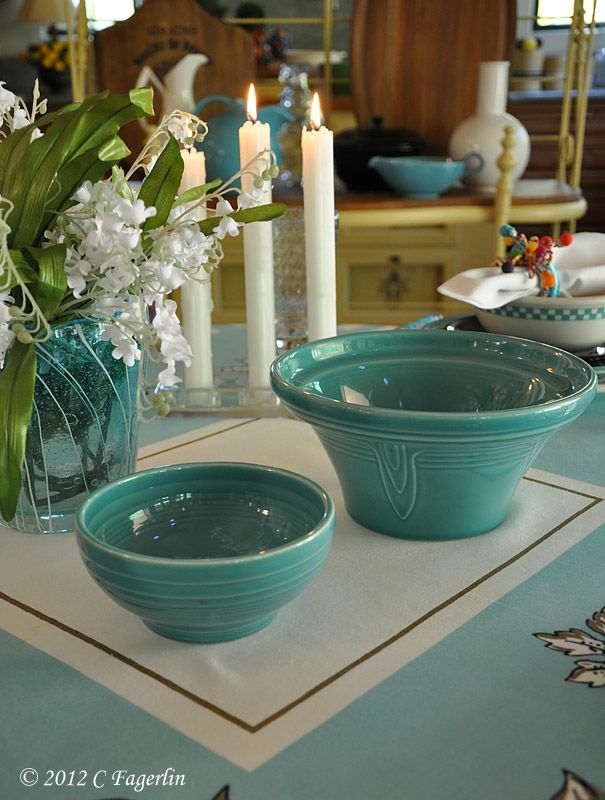 I love these colors ... the turquoise is just wonderful. Everything is lovely. What a perfect combination of turquise and bright white! Your tablecloths are always so perfectly pressed. You must be an expert with an iron! 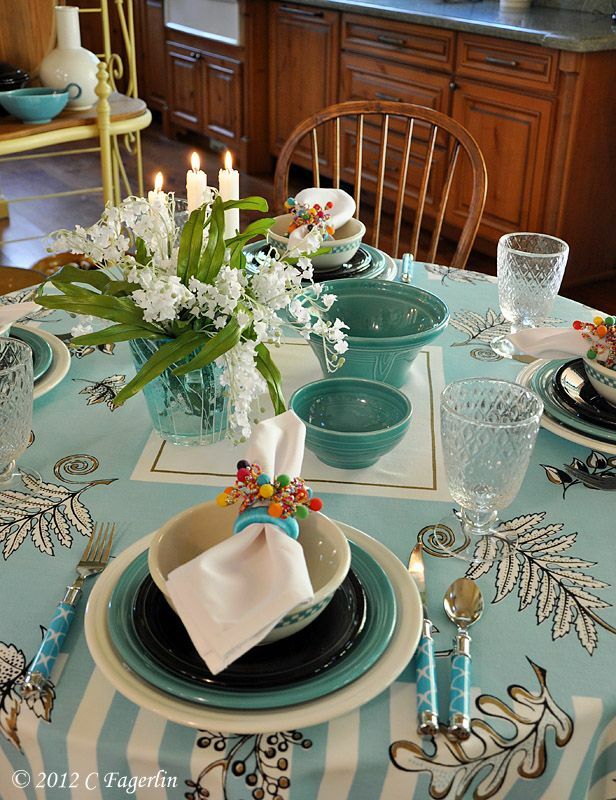 Beautiful tablescape and the overall colors are fabulous, like a rainbow! 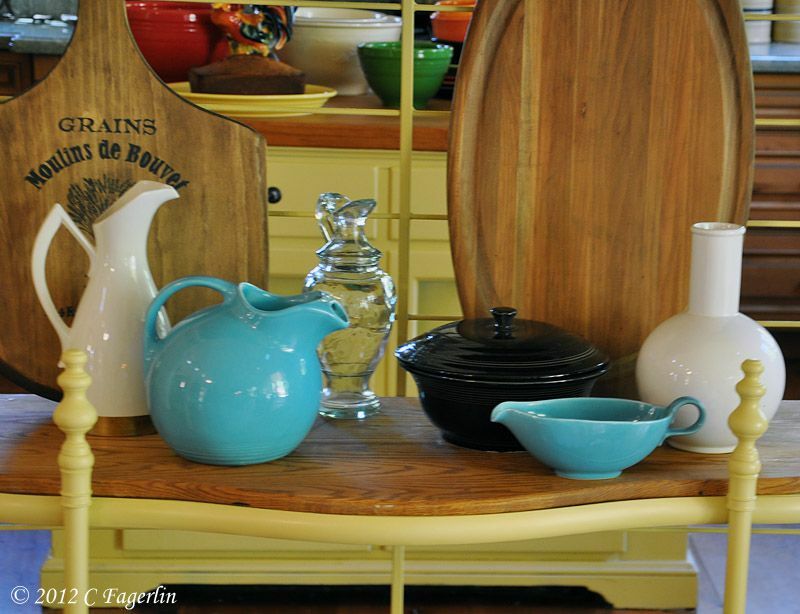 I always love, love your tablescapes and your tabletoppers are the best and also vintage..amazing! 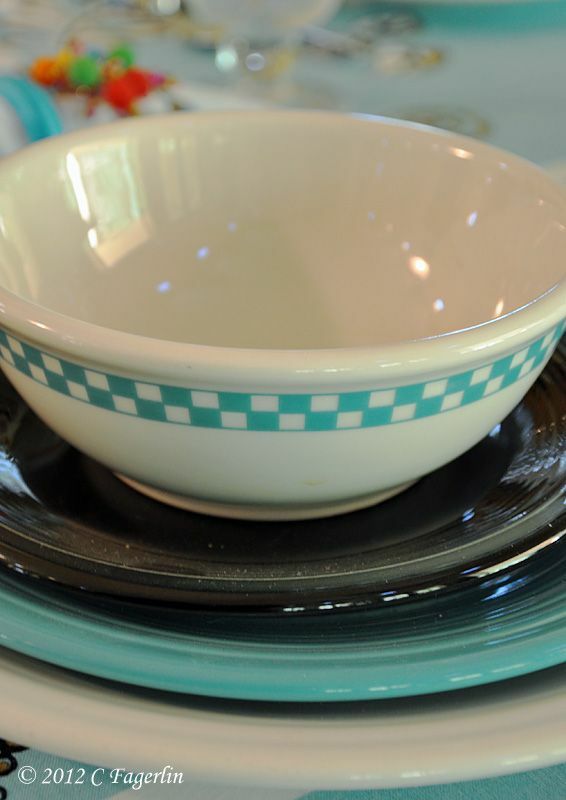 Your dishes are lovely and the turquoise against the white is wonderful. Happy Earth Day! 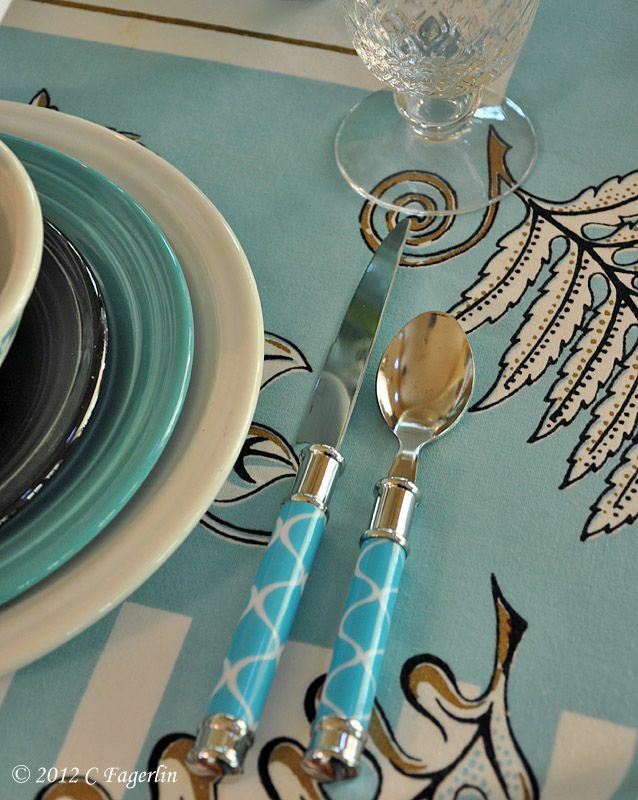 I just LOVE the tablecloth and flatware!! Cute napkin rings too! 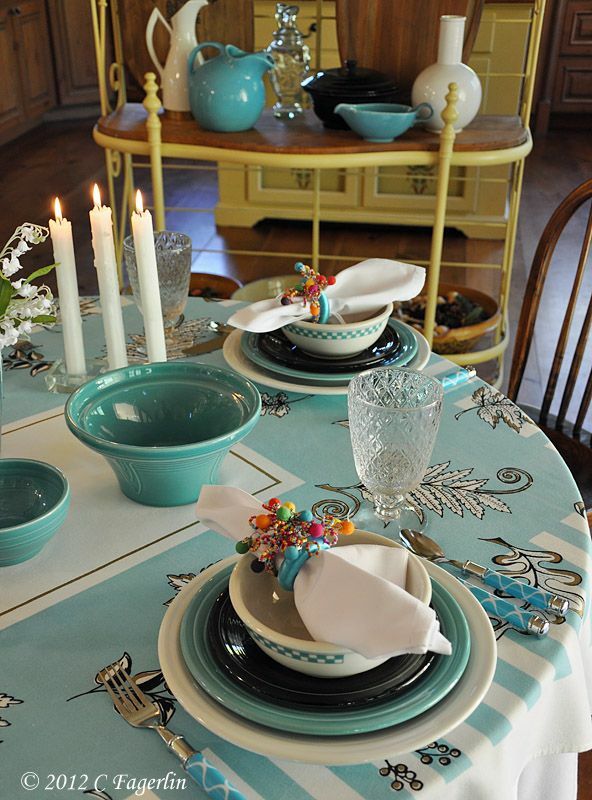 Beautiful job, love the colors you are using for this tablescape. You have done such a perfect job putting all the pieces together. Thanks for sharing. Beautiful table! I love the colors or turquise and white. It's a beautiful combination! Also adore the napkin rings! They add a pop of color and also a touch of whimsey. I would love to sit at this table! So cool and crisp, Candy! I like seeing that cloth in all of the different colorways. Candy, I love the vibrant color of the cloth! You always manage to put together the most amazing tables. 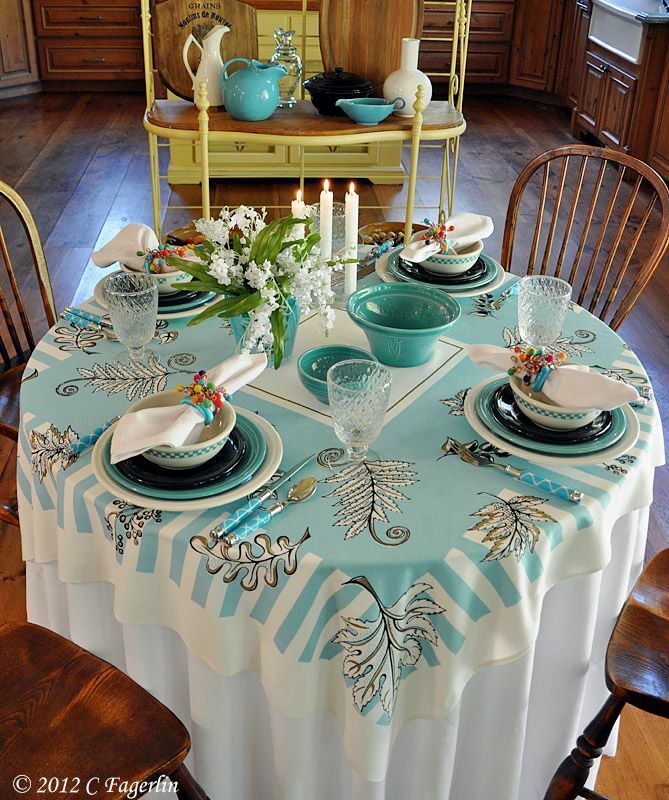 You make me want to go out and buy some Fiesta Ware and some gorgeous vintage tablecloths. Great job!! Here from Seasonal Sundays...this took my breath away at the thumbnail but the full post is just amazing. 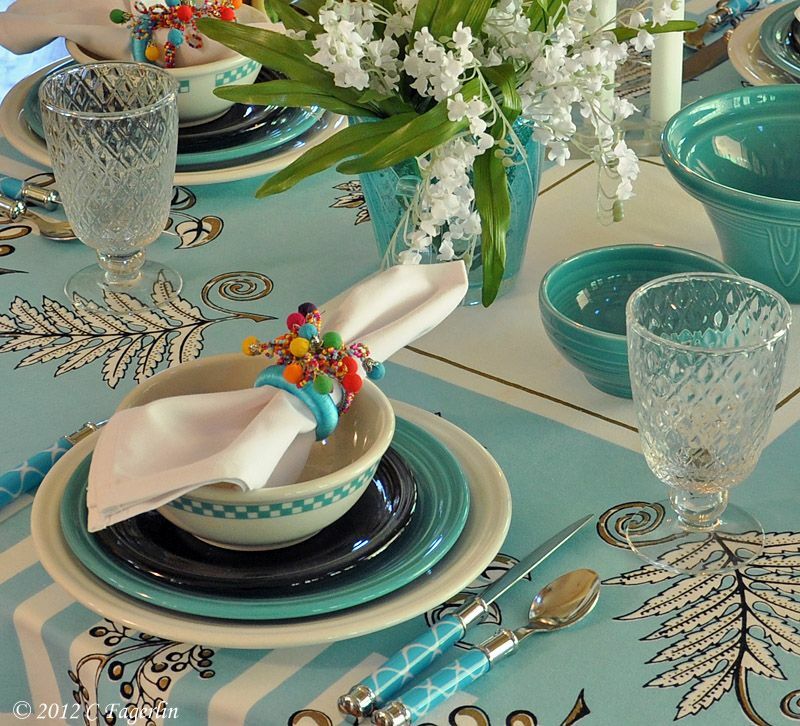 Very well done, I love the colors so much and those napkin rings are PERFECT! Your table is wonderful! Loving that color more and more. Your center piece is delightful too. Have a great day! 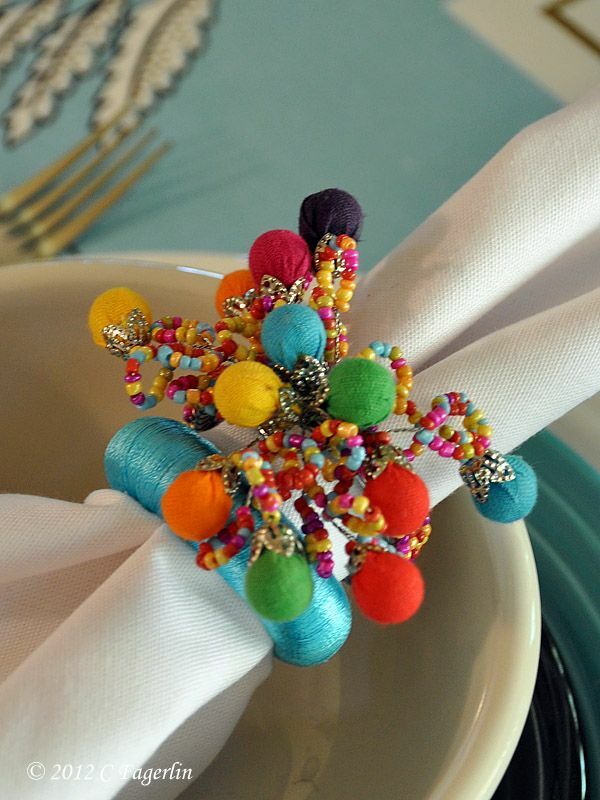 I love the pop of color with the napkin rings. Beautiful as always. 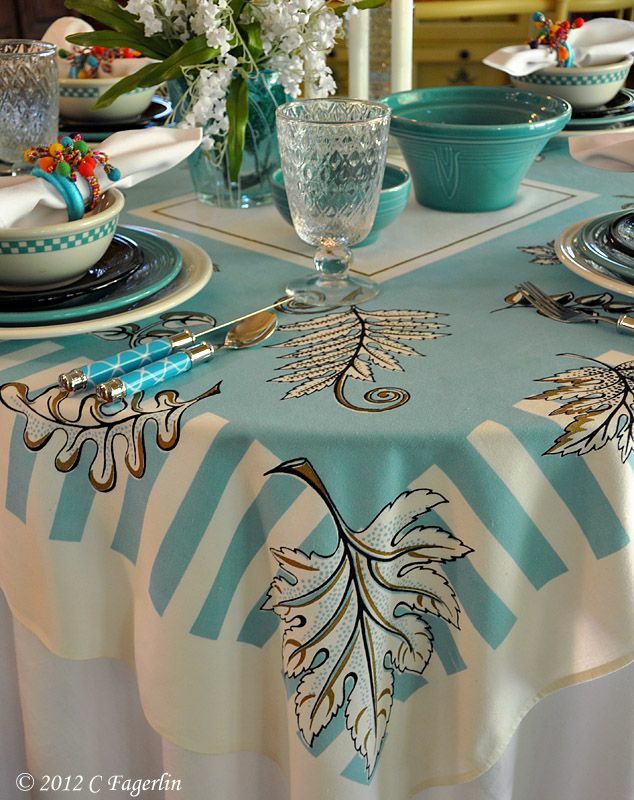 Gorgeous tablecloth and the table is always spectacular with Fiesta Ware. 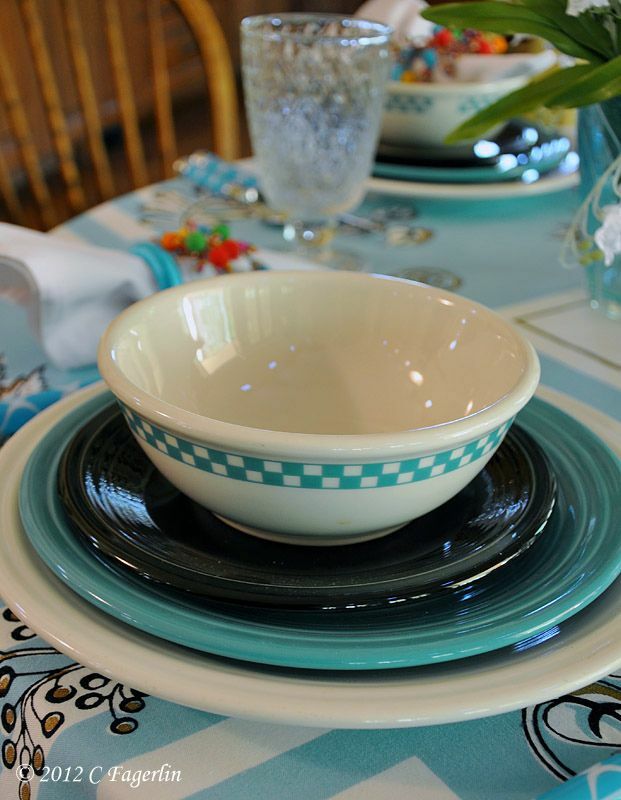 It is always so much fun to see how you are going to use your Fiestaware in your blogs. 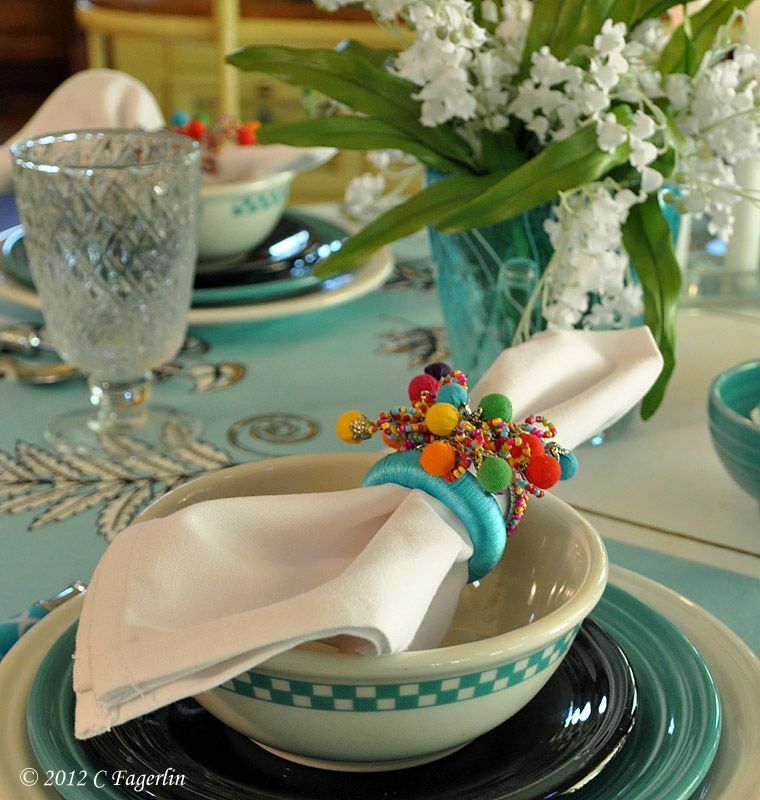 This one is fantastic - the colors are great and I love those napkin rings!! Oh, so pretty. Love all of the turquoise.